Lady Gaga is known for her unusual style. The pop singer usually dresses up in the most bizarre costumes, which are beyond the wildest imagination of a normal individual. The costumes, the hair and the make-up all combine to form the distinct aesthetic, which the singer tries to portray. To her credit none of her styles are ever repeated again. She innovates and wears something different every time. Her unique style is synonymous with her personality. The short blonde bob is a casual style that is enhanced by the glitter sequencing above the eyebrows. This edgy blonde bob is styled in a concave fashion. The bold red lips and the black flicked eyes accentuate the style and give it an altogether different feel. The top bun gives a distinct feel to the style. It certainly adds to the quirkiness. The platinum dreadlocks seem to be combined with the smooth tresses. The style represents a chaos with the unkempt look. The unique ponytail is a perfect blend between a pony and a bun. The knotted ponytail is turned into a small chignon bun. The white waves give a sober and serene effect to the sparkling style and the peculiar outfit. The white pleated suit has the edgy appeal when teamed up with the blunt bob and the round black glasses. 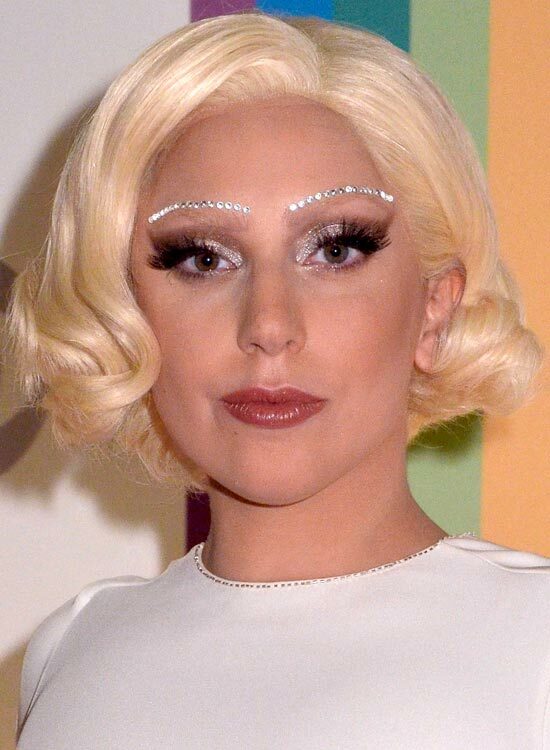 Lady Gaga exudes a distinct grace in this half head covered costume. The open platinum wavy hair enhances the whimsical style. The glittering beaded costume is enhanced by this ordinary wavy hairdo. The dreadlocks offer a great amount of fervor to the style. The hairdo blends perfectly with the unusual neck piece and the attire. The white hued hair along with the sleek subtle waves, give this hairdo a quirky essence. The hairdo is often teamed with a dull shade of makeup, enhancing the style. 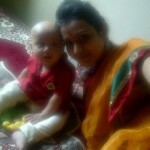 A person who can easily be described as unusual, her choice of hairstyles is on the same vicinity. 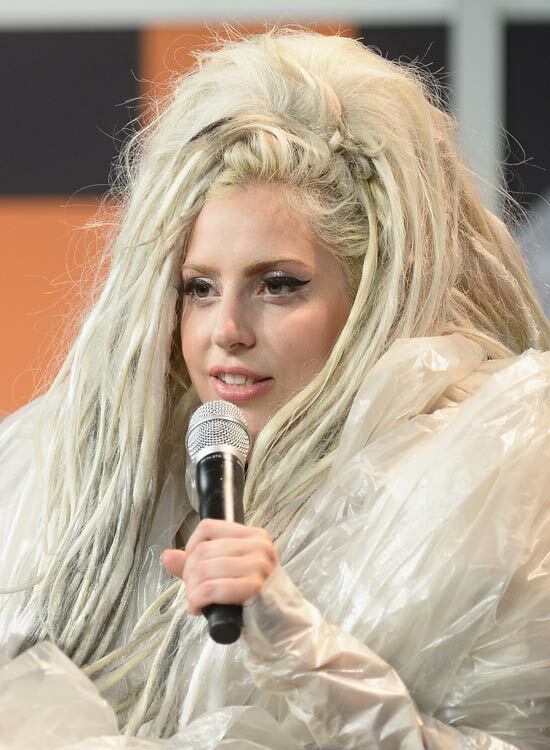 Carrying off a conventional bob is easy, but Lady Gaga makes it seem easy with this even fringed bob. Well, the headgear does add to the essence. The sleek hairdo has a subtly ruffled twist to it. The jet black hair shines and stands in contrast with the face. The messy big brown hairdo looks untidy and disheveled. The unusual hairdo consists of long dry wavy tangled tresses. The large hat with the choppy layered hairdo gives an extraordinary mystique appeal. 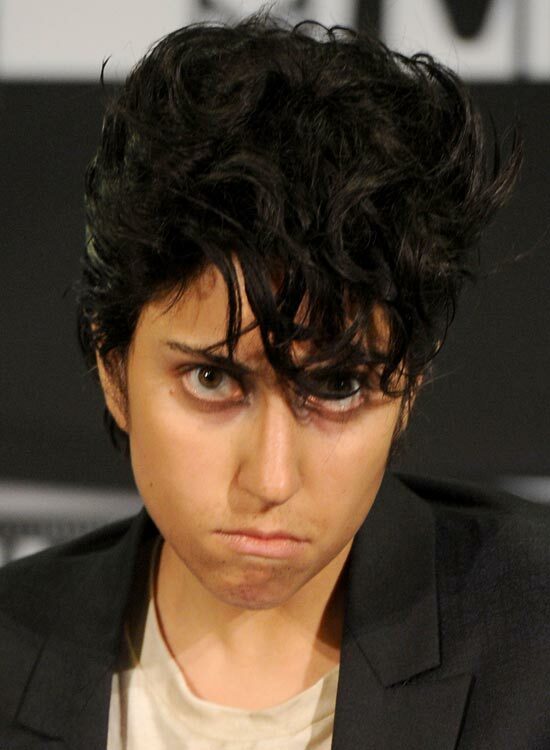 This Lady Gaga hair style resembles an elite quirky persona. The hairdo does involve sharp bent edges, which give a unique feel to the style. The black hat incorporates the ladylike essence to the hairdo. The long Rapunzel like layers are styled to the side. The hairdo reflects the eccentric peculiarity the style possesses. The edgy shades worn and the off shoulder attire go hand in hand with each other. The big volume bob in white, grayish hues exude unkempt wild vibe. The pixie imbibes a ruffled masculine vibe. 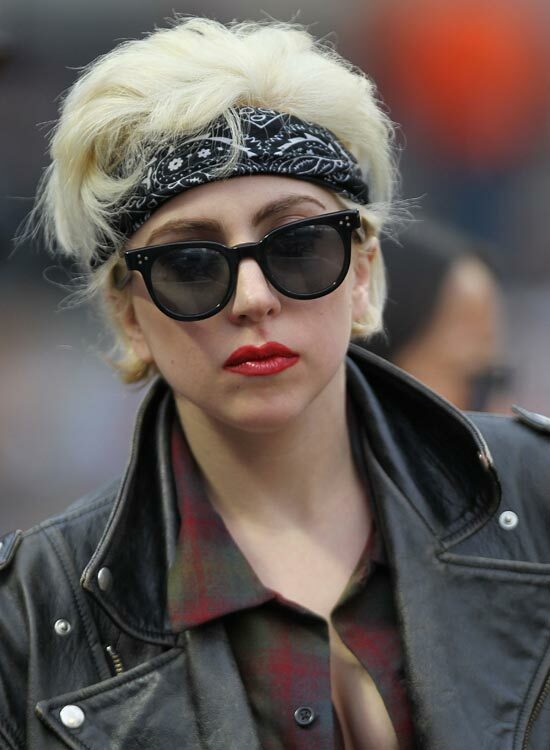 This style clearly brings out the masculine side of Lady Gaga in splendid fervor. The dual hued waves imbibe the essence of black and white. The style resembles an open lid with the half placed cap and the trimmed blonde pixie. The elaborately painted eyelids and the hairdo blend to offer the quirky style. The green fringed hairdo can capture and reflect the alter ego. The hairdo style can make you look like a punk star. Given that she can pull of anything, this blue fringed blunt bob is no exception. This hairstyle gives a stylish and perky look. The veil and the dual colored hairdo represent a peculiar mix of different cultures and style. The white and black long waves with the round shades offer a rock star style. Something that she is! The pink high ponytail done on one side does give an edgy punk appeal! The pink bob with a hair net clip completes the onstage cosplay for Lady Gaga. This was the ultimate style statement she gave at one of the award functions. The whole costume including the hair accessories and the shoes was made with flesh and meat. Definitely a hard style to try! The big ponytail is voluminous and has a yesteryear Hollywood glamour style on display. The yellows and purples seem to splash a blend synchronized in style exclusively for Lady Gaga. The bob offers the wavy edges which gives a masculine appeal that is blended in by the bright red lips. The bandana exudes the Rambo style. The layered pixie gives a very stylish and punk essence to the hairstyle. The sleek ironed out style with the layered edges offers another version to the rock star style clad in leather attire. The pearl embellished face and the white hat complement each other well and give an unusual feel. The pearl and shell inspired attire along with white shoulder length hair offer a different story. The deep yellow hair represents the sun; the attire – the galaxy; the shimmery glitter – the stars. Truly a galactic style on display! The white long hair is styled with glitter. One piece speaks of all the jazz and dazzle on offer. The large hair accessory gives a unique detail to the curvy blonde bob of the singer. The bow shaped bun is indeed a different take from the usual giving a distinct appeal and of course the perkiness. The blonde platinum one side hair is stylish and wavy. The hairdo is a chic updo with short layered bangs at the top. The onstage cosplay of Lady Gaga is exemplarily unique. The messy style incorporates the edginess in all its fervor. The hairdo has an extremely unkempt essence with a chaotic zeal. To be sure, the bob is cut in an irregular geometric shape. The style is well defining thanks to the razor sharp cut. How about covering the whole face? The style is definitely unusual and peculiar. The edgy blunt bob with thin long strand and the round specks highlights the jazzy appeal the style has. The blunt straight bob exudes elegance yet is trendy. This one is not a quirky but a gracious edgy style. 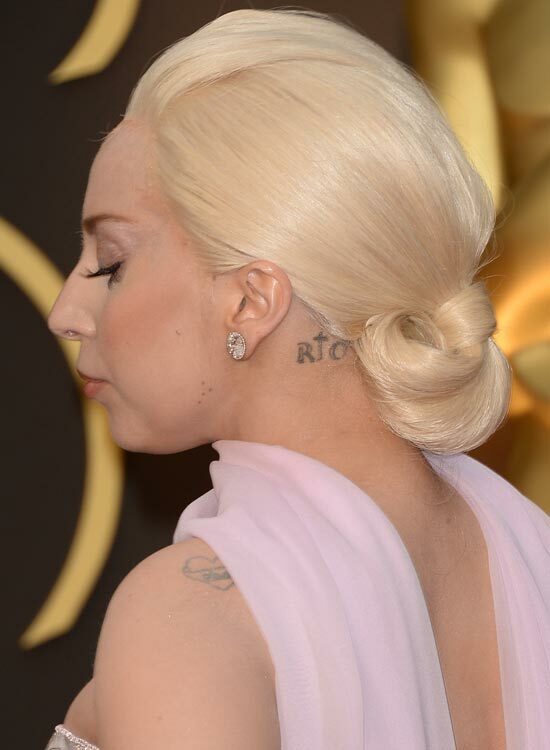 The props give a glimpse of the blonde pink curls of the hair. The style is mindlessly edgy. The feathered apparel is derived from a vintage style. The style is an unusual blend of two styles. The pink blonde bob exudes a different appeal to the style. The hairdo exudes a funky style. The ruffled big curls exude a wild and mystic fervor with the style. The net covered eyes and the big curls together blend in an untamed style. We have listed out 50 best variations of Lady Gaga hairstyles. So are you ready to try out these chic Lady Gaga hair styles? If you have any suggestions, please feel free to write to us by commenting below. We value reader feedback.